Beulah Reservoir, also known as Agency Valley Reservoir, is located in the Agency Valley at 3600-foot elevation, 15 miles north of the small town of Juntura. The 110-foot-high earth-fill Agency Valley Dam on the North Fork of the Malheur River was built in 1935. 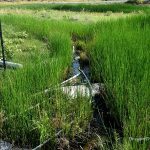 With the total capacity of 59,000 acre-feet, the reservoir receives drainage from 440 square miles, mostly from the North Fork of the Malheur River, covering 1,900 acres of the valley. No hydroelectric power is generated at the Agency Valley Dam. 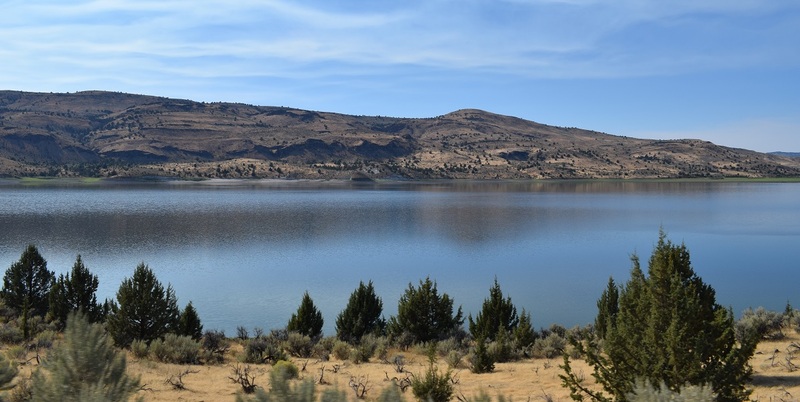 The shoreline of the reservoir is managed by Bureau of Land Management (BLM). The Malheur County maintains a concrete boat ramp, a gravel parking area, and a vault restroom just above the dam. 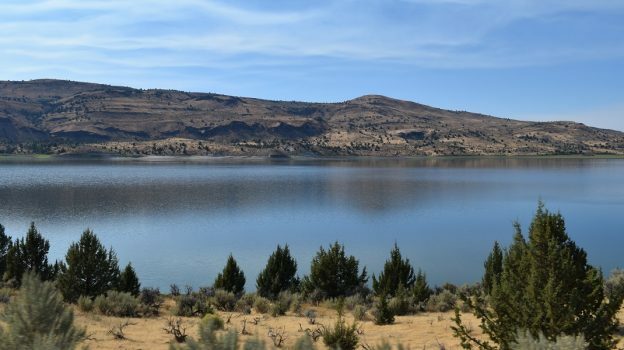 Beulah Reservoir provides the great opportunities for a wild range of recreation including fishing, boating, water-skiing, camping, rockhounding, and even soaking in hot springs. There are campgrounds and facilities for launching and mooring boats, but no camping improvements. Also, camping is available in the Chukar Park Recreation Site. The reservoir is open for angling year-round. A few times a year it is stocked with hatchery rainbow trout. Also, local whitefish, Dolly Varden and redband trouts are available. Beulah Hot Springs is located northeast of the reservoir. Currently, it does not offer a great soaking - the bathtub is corroded and hoses hardly transfer the hot mineral water from the source. However, this location is captivated visitors with its colorful geothermal pool and stunning natural beauty. 175 miles southwest of Portland. Rockhounding for fossilized leaves, fish fossils, agate, and jasper is available on the southeastern shore of the reservoir. 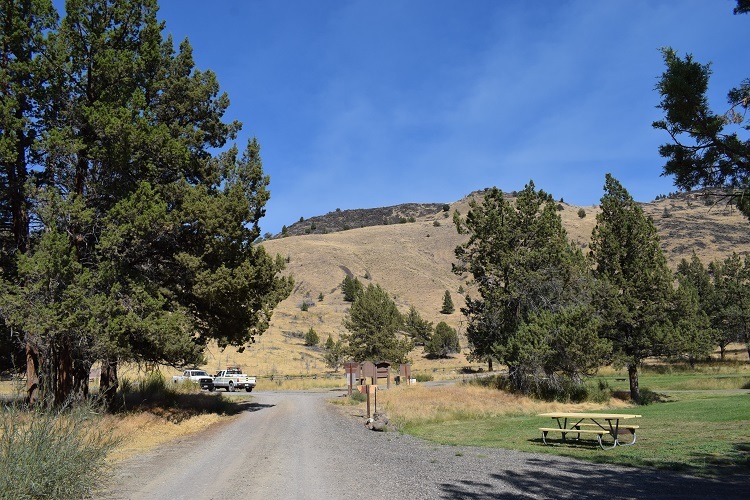 A developed campground for tents, RVs or trailers along the North Fork of the Malheur River, Chukar Park Recreation Site is managed by BLM. The park is located 6 miles north of Highway 20 and 9 miles south of Beulah Reservoir. The gravel road is good but it is advised that visitors opt for a 4x4 drive during rainy or snowy seasons. The camping and soaking are for free. Beulah still needs a lot of re-engineering to become more convenient and comfortable for visitors, but if someone is looking for an isolated, magnificent area to enjoy all activities it offers, then this is the place to visit. Drive 14.3 miles to the destination on the left. During wet weather, a high-clearance vehicle is recommended.